The original inspiration for the shoot by Alessandra Favetto. Last Sunday I has a full day in a Lower Hutt studio to produce images that will be entered into national competitions. The first was inspired by an image I saw in the July issue of F11 magazine by Italian photographer Alessandra Favetto. I has long held the view that models are often treated as mere clothes hangers, and so I knew that I could use the image as a base. 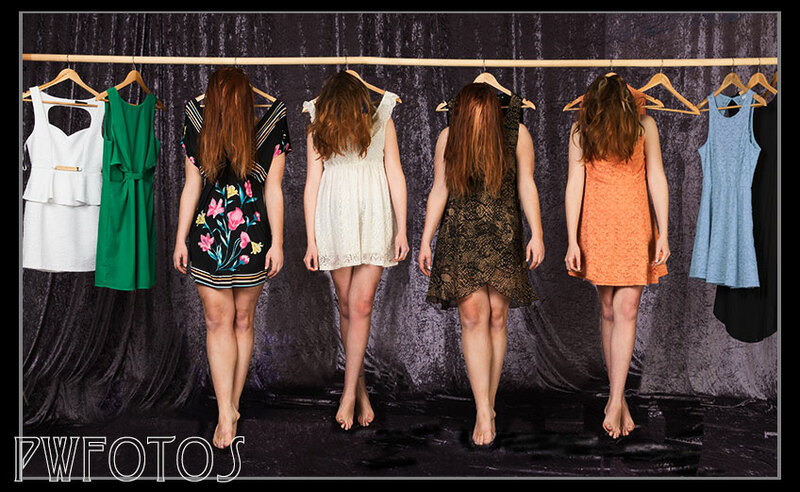 However I wanted to have more than one person in the final image and to have the models hanging from a rack of some sort. I posted the image in a modeling Facebook group and as I suspected got an immediate response. While I had initially thought that I would cast three models I ended up selecting five. Past experience from shoots had taught me that it was unlikely all five would make it to actual shoot day. I also knew that the shot could be something that required assistance so I managed to elicit the help of fellow photographer Alan Raga. As I suspected would happen, in the week leading up to the shoot one model discovered that the timing clashed with a family event and a second one sprained her wrist and ended up in plaster. A third model then failed to respond to any of the communications sent out in advance of the event, and simply didn’t show up on the day. This was exactly the issue that I had spoken about in my recent blog post on “Tips for models“. In the end Summer & Renee turned up right on time. I had asked the models to bring a number of outfits so that we had a good variety. Renee brought a small suitcase while Summer only brought two (both of which were very similar). We selected initial outfits and the girls got changed. I had to ask Summer to go and change her bra because she had a purple one on under a white top. In terms of preparation this was going to be a very easy shoot because no hair or makeup was required. I knew that it would require several images to be taken though and then composited together. Past experience in this area has taught me that when you plan to do this having the lighting, camera position and focal length consistent between all shots make it so much easier in post. The staging for the shoot was very simple with a large fabric backdrop that extended onto the floor and covering a small platform for the girls to stand. The hangers were suspended on another backdrop support. Once the girls were in position we raised the support up to create the illusion that they were hanging from it. The main light was a large octobox set just left of the camera and high. The fill light was set camera right and down low. I was shooting tethered into a laptop with the camera mounted on a tripod. 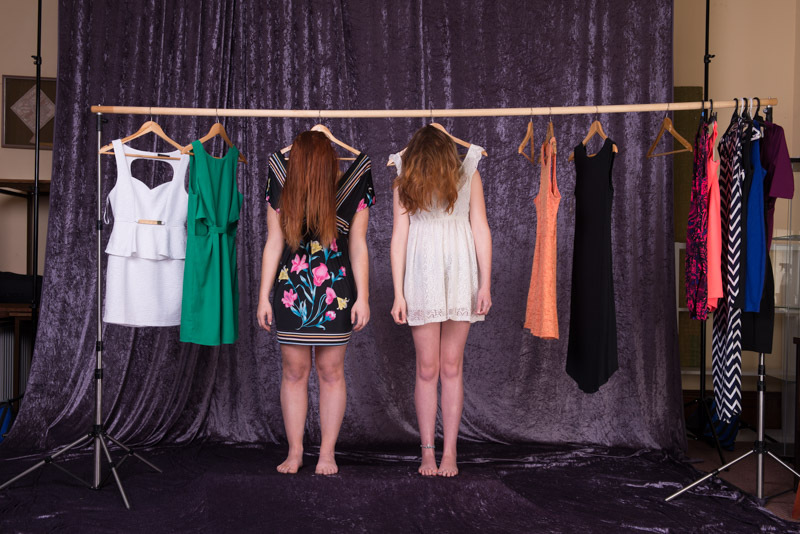 Once we had the shots of the girls on the hangers we removed the platform and positioned two high backed chairs in a similar position to where each model has been standing. The girls then raised themselves up and I took the photo. I had originally envisaged three models on the rack but decided that there was room to shoot four so both Renee & Summer got changed and we repeated the process again. Putting the images together was relatively simple process as the hem of the skirts provided a good point to merge the images. The hardest part was blending the backdrop and in future I will chose a material that is much more consistent in colour. As often happens when you look at the images in post you realise that there was something that could have been done better during the shoot. In this case it was the realisation that the dress chosen for Summer in the second shot (orange) was actually hanging next to her in the first series. Fortunately colour is easily changed in photoshop. The competition it is being entered into closes on August 13 so I still have a little time to tweek it further before then. It was a very smooth shoot and it only took 40 minutes to get all the images we needed. Thanks to Renee, Summer and Alan for making it an enjoyable event.